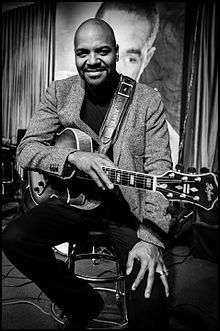 Bobby Broom (born January 18, 1961), birthname Robert Broom, Jr., is an American jazz guitarist, composer and music educator born and raised in New York City who relocated to Chicago, which has been his home town since 1984. Broom performs and records with his group The Bobby Broom Trio and his organ group, the The Bobby Broom Organi-Sation. While versed in the traditional jazz (bebop and post-bop) idioms, Broom, like many current artists, draws from a variety of American music forms such as funk, soul, R&B and the blues to create his style. Broom was born in Harlem (1961) and raised on New York City's Upper West Side (1970s). Broom began studying the guitar at age 12, taking lessons first in folk music. A year later, he began studies with jazz guitarist Jimmy Carter in Harlem, where he took weekly lessons for the next two years. He attended the High School of Music and Art (Laguardia High School of Performing Arts), where he played in the jazz ensemble and received an award for Outstanding Jazz Improvisation during his senior year. Broom began his career while still in high school, performing at New York clubs with Charlie Parker pianists, Al Haig, and Walter Bishop Junior. In 1977 he played at Carnegie Hall in a concert with Sonny Rollins and Donald Byrd. He went to the Berklee School of Music from 1978–79, then returned to New York to pursue his career while attending Long Island University. He began working in New York as guitarist for Art Blakey and The Jazz Messengers, Dave Grusin, Hugh Masekela and Tom Browne, eventually landing a contract with GRP Records. In the 1980s, he moved to Chicago. He formed The Bobby Broom Trio in 1990, the Deep Blue Organ Trio in 1999, and The Bobby Broom Organi-Sation. Broom's childhood heroes include Wes Montgomery, George Benson, and Pat Martino. He has worked with Art Blakey, Max Roach, Stanley Turrentine, Kenny Garrett, Miles Davis, Lonnie Smith, Charles Earland, Dr. John, Kenny Burrell, Ron Blake & Eric Alexander, Ron Carter, and Ramsey Lewis. Among Bobby Broom's recordings as a leader is his trio's 2001 release, Stand!, a recording of interpretations of 60s and 70s pop and soul classics which received praise for staying true to the creative demands of authentic modern jazz. Jambands Online magazine said: "Stand! 's theme works well for Broom — it adds accessibility to the set without getting in the way of documenting a skilled trio in its natural element." In 2009 he recorded Bobby Broom Plays Monk with its referential cover shot of the red wagon Monk used for the album Monk's Music. Broom's album was both critically well received and embraced by fans and established Broom as a thoughtful and innovative interpreter of some of the most difficult music to master jazz. Broom's first release of exclusively original compositions was Upper West Side Story (2012). The album reached No. 1. on the College Music Journal jazz chart and was in the Jazz Week and Down Beat Top Albums of 2012. His album My Shining Hour, is an exploration of the American Songbook. The trio of Broom, bassist Dennis Carroll, and drummer Makaya McCraven produce "...among the most satisfying jazz guitar albums likely to emerge this year," said Nate Chinen of the New York Times. Jon Corbett of Down Beat gave the album four starts, saying "Broom is the full monty: ultra-refined timing and tone, continuous flow of ideas, a touch of grease, a treat for the connoisseur." As an educator, Broom began his work in 1982 for Jackie McLean, Director of African American Music at Studies for the Hartt School of Music at the University of Hartford. Over the years Broom has also been a lecturer at the American Conservatory of Music (1986–1990), Chicago Musical College — Roosevelt University (1990–1994), The Thelonious Monk Institute of Jazz (1987), DePaul University (2002–2008) and North Park University. He teaches Chicago high school students for the Ravinia Festival Organization's community outreach Jazz Scholar Program. In 2005 he attended Northwestern University for his master's degree in jazz pedagogy.